Kristin lived in six states and one other country before discovering the magic of the Pacific Northwest, where she now considers herself a local enthusiast of Seattle and its dynamic seasons. 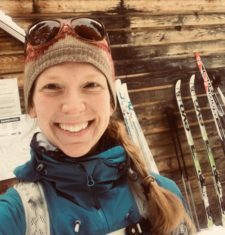 She thrives off any outdoor pursuits that involve traveling fast over epic landscapes with great company (trail running, cross-country skiing, paddling, and cycling to name a few). Kristin has spent more than a decade working and volunteering in various nonprofits with a focus on outdoor recreation and is continuously inspired by the community that is dedicated to increasing equity and opportunity for all to experience the outdoors. She joined Outdoors for All Foundation in the spring of 2018, thrilled to be joining a passion-driven team of volunteers, partners, and staff dedicated to this very cause. In her role, she contributes to the coordination of over 700 volunteers that support year-round programs. She invites you to actively join the mission because it may be one of the most incredible experiences both participants and you have all year!